Bob's Burgers has always been an inspiration. So, if you haven't watched Bob's Burgers before, let me tell you about Tina Belcher. She's the oldest of the three Belcher kids. She loves horses, rainbows, and butts, and she's totally a hopeless romantic. She has a crush on Jimmy Pesto Jr. as well as the whole baseball team. But like many of us, she has little to no social skills, especially when it comes to boys (so basically she’s my spirit animal.) 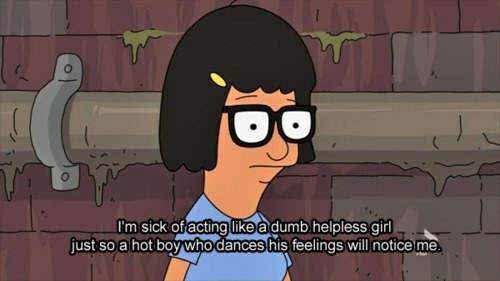 I’m tragically single, and I can relate to Tina on a deep level. I feel like plenty of others can too. So here’s all the reasons Tina Belcher can make you feel excited about your love life. 1.She can take care of herself, and doesn’t need a guy for that. 2. She’s a strong independent woman, who doesn’t always need a man. 4. She’s thought a lot about what all of us ladies think about: relationships and boys. 5. She’s ready for any boy that comes her way. 6. When she gets overly excited about a boy, she definitely has the proper reaction. 7. She knows all the good features about herself, and that’s how she gets the boys. 8. When she actually encounters a boy, the reaction is one we all know to be true. 9. She’s definitely got some moves. 10.She may get down on her love life, like we all can sometimes. 11. But we love her, and we’re always cheering for her! 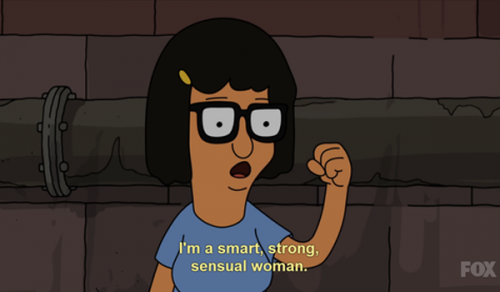 Oh, Tina. What a woman.